On the evening of my due date, I felt some mild sensations within and a little irritable as I put my two year old to bed. 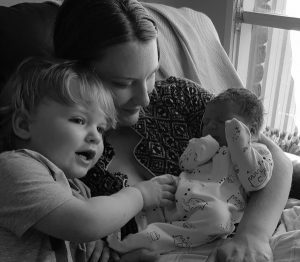 The sensations began to grow a little more intense as I chatted with my husband and we decided that I would let my parents know as they were coming to our house for our home birth. My husband and I sat and chatted in our bedroom, with the lights dim and the hypnobirthing affirmations playing. We were excited but calm and this memory of us sitting in our room with the buzz of excitement in the air, awaiting our next child is one that I will never forget. My surges began to get stronger and closer together and I began to use my hypnobirthing breathing and visualisation techniques. I was enjoying riding the waves. We called our midwives and let them know. My parents arrived and settled in as did our midwives. I still wasn’t convinced that I was actually in labour and remember mentioning to one of our midwives that I hoped I hadn’t wasted their time by coming over (as I then flopped against a wall and breathed through a surge). The midwives left me to labour calmly with my husband and mother providing love and support. Things moved quickly from there. I had a little nest set up on our bedroom floor and found comfort in this space. Throughout every surge, I used my hypnobirthing techniques and was calm, silent and felt no pain, only an intense tightening. I felt safe, secure and rode every wave with the confidence that my body knew what it was doing and that my baby and body were working together. I remember concentrating hard through a deep surge and listening to Melissa in my ears and feeling strong and connected to every woman who has given birth before me and all of those that would give birth after. How amazing we are. My water broke after a strong surge when I was alone in the room with my husband. Now I knew it was really happening! The midwives now came in to join us and I had an incredible feeling. I could feel my baby moving down and a deep groan came out of me, as if instinctively. I told everyone that I was feeling him move down and feeling as though my body wanted to push. After some focused breathing pushing my babies head out, the rest of him slid out with the most incredible relief. He let out a wonderful cry and was passed to me as I knelt on our bedroom floor with my husband by my side. I lay there on our floor with my husband and my Mum watching as our baby latched on and had his first feed. I birthed the placenta easily and my Mum cut his cord. After laying with my baby for such a long time, I had a shower and hopped into bed with our new little man and my husband, the best feeling in the whole world. We stayed here until the morning when our two year old son came in to meet his baby brother. It was exactly as I had visualised it during my hypnobirthing practice – incredible! This birth experience was everything that I dreamed it would be. Calm, positive, beautiful and life-changing. I cannot speak more highly of the practice of hypnobirthing for a positive, calm birth and a positive and calm pregnancy. Every mother deserves to feel this empowered after giving birth. My labour was an hour and a half. Fast, intense and incredibly beautiful. Thank you Melissa. You have changed my life!